Cut each piece of chicken in half horizontally and place each piece between 2 sheets of plastic wrap. Using the smooth side of a meat mallet, pound out to a 1/4-inch thickness. Place the 8 chicken pieces on a baking sheet and sprinkle with salt and pepper. Mix mayonaise and dijon mustard and spread over chicken breasts. 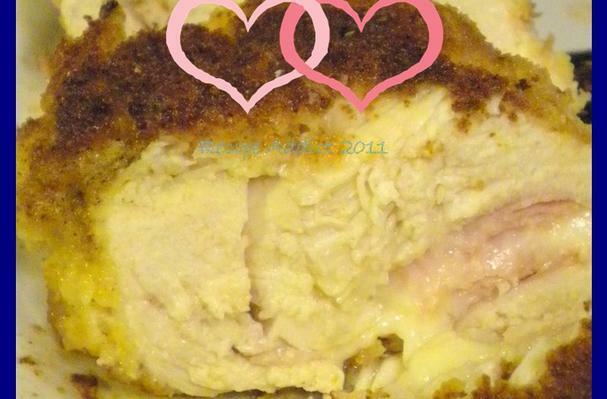 Divide cheese evenly between 4 pieces of chicken. Arrange prosciutto ham slices evenly over cheese; top with remaining 4 pieces of chicken. Tuck in any cheese or prosciutto ham that extends over the edges. Secure chicken pieces together using toothpicks along the edges to seal the edges. Place flour in a shallow dish; season with 1 tablespoon essence. In another shallow dish, mix together eggs and milk using a fork. Place bread crumbs in a third shallow dish; season with remaining 2 teaspoons Essence. Dip a chicken bundle in flour, shaking off any excess. Dip chicken in egg mixture, followed by seasoned breadcrumbs; transfer to a plate. Repeat process with remaining chicken bundles. Place chicken bundles in skillet and cook, until browned on one side, about 4 minutes. Transfer to prepared baking sheet and place in oven. Cook until cheese is melted and bubbly and chicken is cooked through, about 4 minutes. A simple and delicious, yet elegant meal for any occasion.